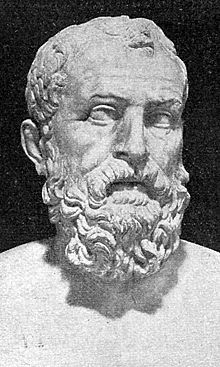 Solon was a statesman in Ancient Greece. He is one of Seven Sages (or Wise Men) of Greece, because of his political reforms to the laws of Athens. Many of these changes helped the poor people. He lived from 630 B.C.- 560 B.C. He introduced the court and judges. About 594 B.C., the nobles elected Solon to lead Athens. He made reforms that helped prevent a revolt by the poor. First he freed people who had become slaves because of debts. He made a law that no citizen could be enslaved. Solon also organized citizens into four classes based on wealth, not birth. Rich men had more power; yet this was still a fairer system than the old one that limited power to nobles. Solon allowed all citizens to serve in the assembly and help elect leaders. He also reformed the laws to make them less harsh. This page was last changed on 8 March 2013, at 21:51.